Interested in getting your viscometer and/or chips calibrated? We recommend getting your viscometer and chips calibrated once a year. The viscometer unit can be calibrated on site or at our service location. We ask that all VROC® chips are sent to our service location for extensive calibration procedures. 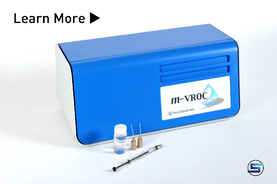 VROC® technology powered viscometers, microVISC™ and m-VROC™,are both small sample viscometers capable of improving your viscosity measurements.